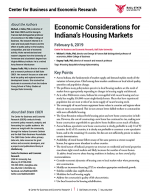 In this study, we provide a county-level analysis of housing markets in Indiana with considerations for the role that population change, income, human capital, and amenities play in the supply and demand for housing. To provide context for our annual economic forecast, we review last year's projections and offer analysis of recent tax cuts, import tariffs, and monetary climate. We then provide an updated economic forecast for 2019-2022 and analyze performance at the state and local levels. Our keynote presentation was by Dr. Jennifer McCormick, state superintendent of public instruction. 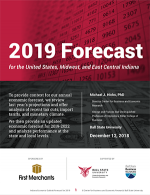 The 23rd annual Indiana Economic Outlook was held on December 12, 2018, in downtown Muncie. 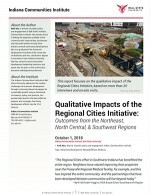 This report examines the qualitative impact of RCI based on 30+ interviews and on-site visits. In this policy brief, we focus on the uniformity of property tax assessment in the state and whether trends indicate that assessment is becoming more uniform over time. Data presented here indicate that overall property tax assessment uniformity is improving—property assessed values are moving closer to sale prices. Produced for the Indiana Association of REALTORS. 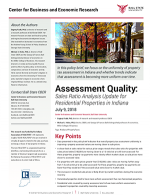 Assessment Quality: Sales Ratio Analysis of Residential Properties in Indiana. 2015. 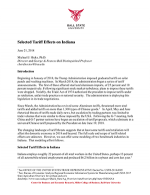 CBER director and economist Michael Hicks examines the tariffs proposed by the Trump Administration and estimates their effect on the Indiana economy, considering both the industry and workers.